Promat's Professinal Grade Vented Carpet Protector PROMAT is a perfect fit for your auto detailing solution. Conceived by a professional who has been managing pre-owned inventories for 23 years, the carpet protectors are manufactured and designed specifically for the auto industry. The Peel Stick technology allows anyone to install in seconds perfectly every time without waste. Promat carpet protectors are vented to allow air circulation to reduce the chance of mold and mildue odors. At Promat Inc, we can professionally print and clear coat your dealership logo and or message in full color. Promat will deliver the highest value and protection with the least cost, time and preparation. 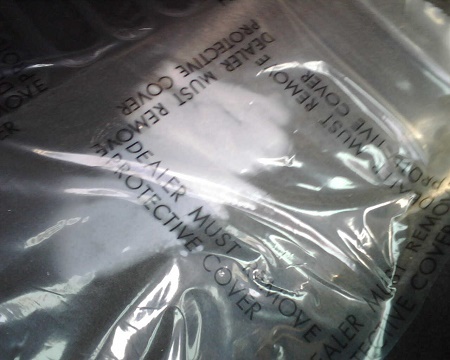 PROMAT Vinyl Peel Stick Carpet Protector's are the choice of OEM CPO Programs! After using your wet vac, leave the doors open for ventilation. If this is not an option, be sure to open windows enough to let air flow dry the floors. Moisture: Any trapped moisture will start the mold process. All adhesive carpet protectors use acrylic-based adhesives. Acrylic adhesives are water based to allow for easy cleanup so, if there is any moisture in the carpet during application, it will have an effect on the adhesion. The carpet must be dry for good adhesion. Conditioners: Products containing silicone or lanolin will greatly reduce adhesion. These products are viscous, or slippery by nature. You will find such additives in some carpet shampoos, carpet coloring chemicals, or carpet protection products such as Scotch Guard. If the carpet has been conditioned with products containing these additives, it must be thoroughly cleaned before the adhesive will stick. Temperature: The temperature range for this product once installed is from 40 degrees below zero to 200 degrees Fahrenheit for the adhesive to remain intact. The ideal conditions are above 50° and below 95° Fahrenheit. The workable temperature range may vary in different parts of the country. Ideal storage temperature is a minimum of 50 degrees. Don't adhere PROMAT to wet carpet; simply lay the protectors on the floor with backing, or substrate intact, and adhere the PROMAT Protectors when the underlayment is dry. PROMAT does not leave any residue on the carpet itself. Finding the best adhesive available that didn’t leave adhesive residue and could handle these temperatures was our biggest challenge. After one year of testing many different vinyls and adhesives in and on the front line of a select few dealerships, we have come up with what we believe is the best carpet protector in the market. 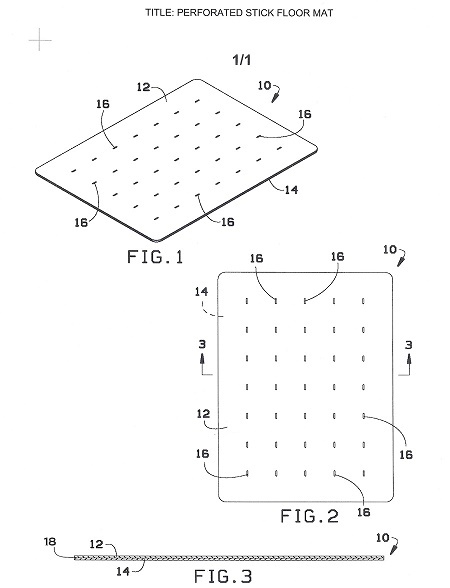 The substrate has a die cut allowing the detailer to peel off the large portion, leaving a portion of the substrate for easy handling and positioning. 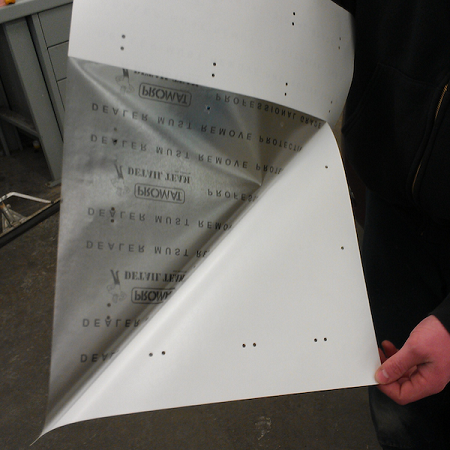 When the product is in perfect position, the detailer can simply peel of the rest of the backing or substrate. The backing or what we call the substrate of every PROMAT is coated, this allows the detailer to just drop the PROMATs in the car after a finished detail for instant protection and install the carpet protectors at a later time. The 48 small 1/8 in. ventilating holes are very important, letting air circulate through the carpet helps reduce the chance of mold and mildew smells. Though the carpet may appear to be dry after detailers shampoo them, the under lament of the carpet is still damp and when covered by the traditional roll-off carpet protectors, you are trapping the moisture. This is what causes mold and the mildew smells which makes the vehicle virtually impossible to sell. Evaluation: PROMAT’s next step was to work with Professional Detailing Personal to find out the negatives of our competitions product. Our research showed that dealers using the traditional roll-off product wasted up to 30% because of the difficulties of installing and handling. This is when we introduced the Peel & Stick concept; detailers love this product simply because of the ease of use. The detailer can throw the product into a car if the carpets are still damp and install at a later time on the lot. PROMAT put a protective coating on the back of the substrate so the moisture doesn’t damage the PROMAT carpet protector. We also put a die cut in the back so the installer can tear off the large portion and still have 6 inches of backing to hold onto for easy alignment or placement, eliminating wasted product. Product Limitations-Cautions: This product is considered Pro-Grade and is designed for carpeted surfaces only. The use of the product on non-carpeted surfaces is discouraged. Vinyl inlays in automotive carpet are not excluded from use. Use only on synthetic fibers! For best performance, carpet surface should be totally dry before applying the product. Allow the carpet to dry completely before taking off the backing to apply. This product is intended for short-term use only. Remove the product no later than 60 days after application. This product uses an acrylic-based adhesive and will clean up with water. Solvent should not be used to clean any residual adhesive. Dispose of product in a safe manner. Wad the product into a ball to insure the adhesive will stick to itself. This will minimize the chance of small children becoming entangled in the product. The seller does not in any way warrant the fitness of the goods supplied for buyer’s particular purpose. It is understood and agreed that seller’s liability and buyer’s sole remedy, whether in contract, under any warranty, in tort (including negligence) in strict liability or otherwise shall not exceed the return of the amount of the purchase price paid by buyer, and under no circumstances shall seller be liable for any special, incidental or consequential damages, including, but not limited to personal injury, property damage, damage to or loss of equipment, lost profits or revenue, costs of renting replacements and other additional expenses, even if seller has been advised of the possibility of such damages. The price stated for the products is a consideration in limiting seller’s liability and buyer’s remedy. Seller will not be liable for any damages, losses or expenses as a result of buyer’s negligence. Whether deemed active or passive and whether or not any such negligence is the sole cause of any such damage, loss or expense. With your consent. If you would like help setting your preferences to share information or restrict data from public access such as your email address, please contact the Director Steve Step at: Stevestep@2promat.com. We may share with domain administrators such as the Web Administrators at PROMAT to: receive your account information in order to satisfy applicable law, regulation, legal process or enforceable governmental request. If you have a Google Account you can alter the information gathering controls at your own account level. Google analytics is the only routine data sharing PROMAT does, so please feel free to adjust your privacy settings with Google to control what they can track here before we share it with Google. We will share personal information with companies, organizations or individuals outside of PROMAT if we have a good-faith belief that access, use, preservation or disclosure of the information is reasonably necessary to: meet any applicable law, regulation, legal process or enforceable governmental request. To detect, prevent, or otherwise address fraud, security or technical issues. To protect against harm to the rights, property or safety of Promat, our users or the public as required or permitted by law. Copyright © 2016 Promat Inc. All Rights Reserved.